This photograph, taken from the top of the Washington Monument, shows hundreds of thousands of people on the National Mall in front of the U.S. Capitol during the Million Man March in Washington, D.C., Oct. 16, 1995. Black men from across the country will assemble on Washington, D.C.'s National Mall on Oct. 10 to mark the 20th anniversary of the iconic Million Man March. Just as a generation ago, the Nation of Islam is the main organizer of the rally. Dubbed Justice or Else!, the gathering demands equal justice at a time when many are protesting police violence against African-American men. Two decades ago the focus was on black men pledging to take responsibility for themselves, their families and their communities. The challenges ahead were significant: disintegrating family structures, pervasive drug addiction and violence within black communities, and hopelessness for the future of black children. 1. It mobilized black men for community involvement. Speakers at the gathering two decades ago called on black men to step up and get involved in empowering their communities. There was a sudden explosion of black men taking up the challenge. The Philadelphia Inquirer reported three days after the march that “there is already evidence that men who have returned from the march are getting involved in community groups.” It served as a catalyst for scores of community organizations, such as the local 100 Black Men chapters of Greater Washington, D.C., and Savannah, Ga., which trace their origins to the Million Man March. 2. It contributed to an increase in black voters. 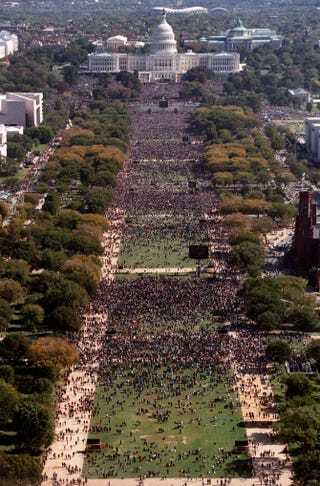 At least 150,000 participants at the Million Man March registered to vote. There’s no way of knowing how many others returned home and registered after the event or to what degree the rally inspired an increase in political participation. But according to the U.S. Census Bureau (pdf), there was a steady rise in black voting rates after 1996. In fact, the black turnout rate increased by about 13 percent between 1996 and 2012, the agency reports. 3. It sparked an interest in black adoptions. The National Association of Black Social Workers told USA Today that thousands of families inquired about adoption after the Million Man March. The group attributed more than 300 adoptions to the rally. The media also told the stories of black families, inspired by the march, who adopted foster children. But there’s still much work ahead. The percentage of black children in the foster-care system decreased between 2004 and 2013 (pdf), according to the U.S. Department of Health and Human Services’ Child Welfare Information Gateway. However, they enter and remain in the foster-care system at a disproportionately higher rate in comparison with children of other races. The National Black Caucus of State Legislators points to myths, such as the difficulty of rearing black children, that contribute to the difficulty in placing them in permanent homes. 4. It showed that brothers could rally peacefully around a common cause. There’s a fear that many Americans feel when black men congregate. The Washington Post reports that authorities in the nation’s capital are on alert for possible violence at this weekend’s 20th-anniversary rally. But two decades ago, the Million Man March proved that black men could gather peacefully and responsibly, in huge numbers, to discuss the problems in their communities. The Million Man March is an iconic brand that continues to inspire other movements and organizations. Two years after black men gathered in D.C., black women rallied in Philadelphia for the Million Woman March. Around the same time, a Chicago-based group named the Black Star Project began mobilizing black men to mentor at-risk students in their community. One of its signature events is the national Million Father March, which launched in 2004 with the aim of encouraging fathers to get involved in their children’s education. More recently, protest movements have adopted the name, including the Million Hoodie March in support of justice for Trayvon Martin. Its influence has also reached as far away as Egypt, where protesters held a Million Man March in Tahrir Square.